It's kind of crazy to me that Demmamussabebonk is twenty years old this year. Snuff has been one of my favorite bands in the world for over two decades and this album has been in my top five albums of all time ever since I thought about trying to rank albums like that. A lesser know fact about Demmamussabebonk is that there were two versions of it released back in 1996. The version on Fat Wreck in the US and the UK version that came out on Deceptive records. Fat Wreck rereleased their version as a limited colored vinyl run a couple of years ago. For its twentieth anniversary, Snuff has rereleased the UK version on their own 10 Past 12 records. In my opinion, the UK release has always been the superior version of the record. For starters, the track listing is in a different order and the album comes storming out of the gate with "Martin." If that's not a perfect opening track, I don't know what is. For the life of me, I can't understand why Fat changed that. Also, the mix of the record is completely different from the Fat Wreck version. It's a rougher mix that doesn't sound quite as slick. It just feels like it has more energy and really encapsulates what Snuff is supposed to sound like. The new reissue also comes with a CD of the demos that Snuff recorded for the album. It's an interesting listen for sure and contains all of the songs from Demmamussabebonk as well as demos of the B-sides from this era of the band. When I first opened this reissue, I thought the artwork looked a little strange. Sort of like when some band does a reissue and they don't have the original art files so they try to scan in a copy and use that. I thought the pictures of the toys on the cover looked a little washed out. Well, it turns out it's not from the pictures being reused, it's from the toys getting older. They retook the pictures on the cover using the same toys 20 years later. The clear plastic of the scooter has started to cloud up over time and Happy Clock is also fading a bit. Once I figured out what they had done, I actually really liked the concept of recreating the art twenty years later. After all, we've all aged a bit since this record originally came out. 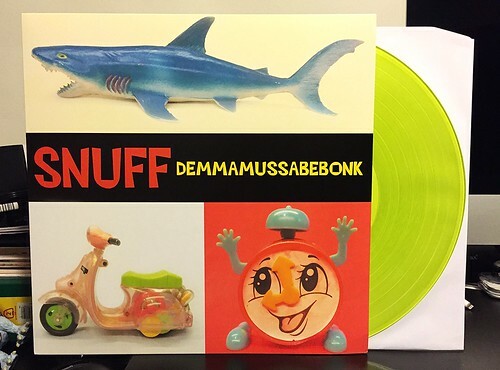 But even though Demmamussabonk is twenty years old, it still sounds as fresh and exciting to me as it did the very first time I listened to it. My highest possible recommendation.